Would you like an opportunity to learn how to make home made whole grain bread in a hands-on baking environment? Bethlehem Harvest would like to invite you to attend one of our bread baking classes that will be coming up soon! Our schedule for the weeks ahead is still unclear, but we will post the schedule very soon and update our followers via e-mail and on our Facebook page. If you are interested in attending any of these classes, please send Gail and e-mail at bethlehemharvest@gmail.com and we will get you signed up! All classes are $20 per person with a $40 maximum per family. 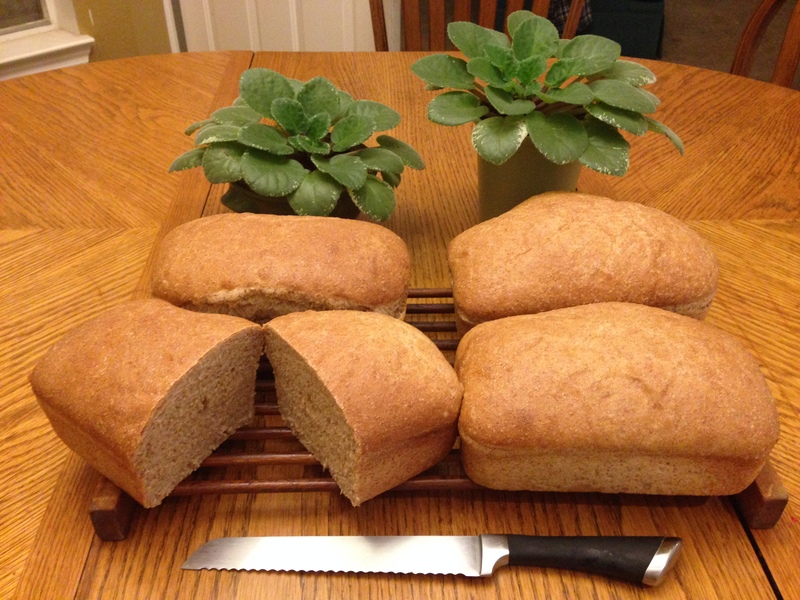 This class is suitable for anyone who is interested in learning to bake whole grain sandwich breads. We will start with high quality ingredients including freshly milled flour and walk through the entire process of mixing and kneading the dough, shaping the loaves, rising and baking the bread. We will end up with loaves of delicious honey-wheat bread and some specialty items like cinnamon rolls or kolaches. This is a very hands on class that is suitable for all adults and for children ages 10 and up who are accompanied by an adult. Artisan breads are a European tradition – something radically different than a loaf of grocery store sandwich bread. These breads feature a small amount of yeast that is allowed to multiply slowly, fermenting a loaf in a way that develops a unique taste and texture. Baked in a very hot oven, these breads are crusty on the outside and chewy on the inside, and when made with whole grain flours, these breads have flavor that is unsurpassed! This class is most suited to the adult student that has some bread baking experience. Sourdough breads are enjoying a resurgence in popular culture both because of their wonderful flavor and their enhanced nutritional value and digestibility. Using a sourdough starter that traveled the Oregon Trail, we will make classic sourdough loaves that are crusty on the outside and chewy on the inside, and oh so very good! You have to have patience to make sourdough bread, but it is so worth the wait!! This bread class is most suitable for students with some bread baking experience. This class will cover all of the baking process from selecting your flour to baking your bread but will have a special focus on using soaked and sprouted grains and slow rising methods. By soaking and sprouting the grains and allowing for longer rising periods, these breads develop a full depth of flavor and provide our bodies with uninhibited access to their total nutritional value. The loaves we make will be full of all the rich goodness of whole grains, nuts, and seeds. This class is suitable for students with some bread baking experience. This entry was posted in Bread Classes and tagged artisan bread baking, artisan bread classes, bread baking classes, Bread baking classes houston, learn to bake bread, Sourdough bread baking classes, whole grain bread baking by Gail DeGray. Bookmark the permalink.